This “O” gauge GWR 10T. Fish Van running number 2080 in post 1934 dark grey livery is built from the Peco kit. It is in very good running order with finescale metal-tyred spoked wheelsets, one of which is compensated. 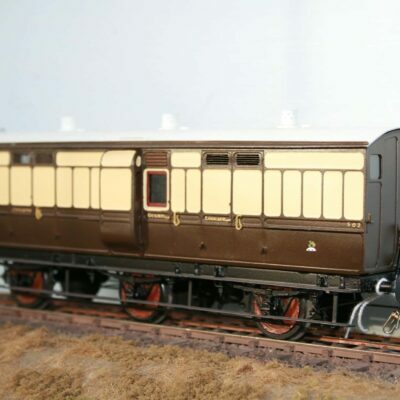 The model is in good condition with hinged opening side doors, painted interior, sprung buffers and sprung couplings (please note one of the couplings will need a replacement 3-link coupling). There is some extra weight built into the underfloor chassis.